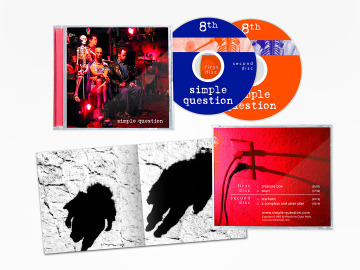 At last, Simple Question’s double-CD, 8th, is out. 8th was produced by Rick at his studio, The Lumber and Cheese Shop and mastered by ambient pioneer, Robert Rich. Although 8th showcases Simple Question’s gentler side, it takes you through some deep, dark terrain, too and makes an excellent audio travelling companion that you’ll enjoy on your way from one moment to the next. Not sure what to expect? Check out some samples from 8th and some live shows.